The #BestMattressEver is a latex mattress. DreamFoam has latex, memory foam and plain foam mattresses in its lineup. The reason BB chose latex for their boxed bed is durability. They believe that latex can last longer after compression and rolling than visco-elastic (memory foam) material. In the boxable mattress market, BB is competing with memory foam mattresses, other latex models, latex memory foam hybrids, a 3-D gel grid mattress, and even an innerspring model. Also, they do not fold the mattress over before rolling it up before boxing it, because if it sat in the box too long, it may crease the foam along the fold, degrading its performance. The box is 45” long for sizes Twin to Queen, but 50” for King and Cal King. The #BestMattressEver is a 10” high 3-layer mattress with graded levels, using both major types of latex foam. 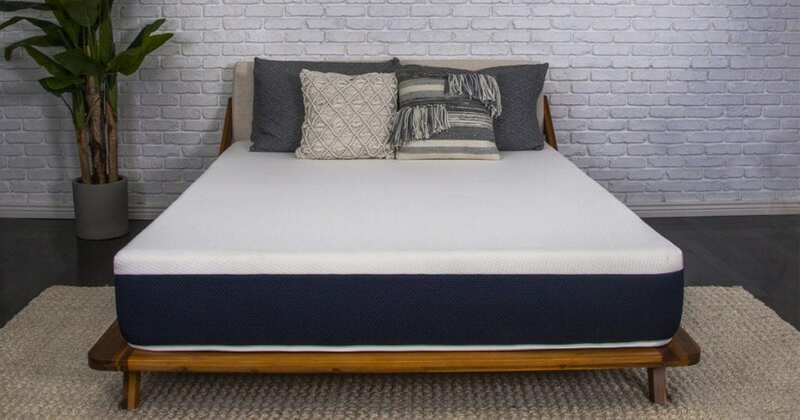 Unlike some of the mattress-in-a-box beds on the market which have only one model with one firmness level, the Brooklyn Bedding offering has a choice of three comfort levels: Soft, Medium and Firm. The cover of #BestMattressEver is quilted pillowtop. The fabric is cotton. It is quilted to soft foam, giving it a ½” un-squished thickness. This is not calculated into the 10” overall mattress height. The top layer is 2” of the less dense Talalay latex to offer pressure relief. Brooklyn Bedding describes it as “Cool & Responsive.” The “Cool” refers to the ventilation pores in the Talalay latex, which let air flow through the foam. Talalay in mattresses is valued for its rapid response conformity. People who prefer latex don’t like being cupped by memory foam, because it makes them feel trapped. One reviewer said that this mattress is for you if you are a fan of latex, but not for you if you love memory foam. 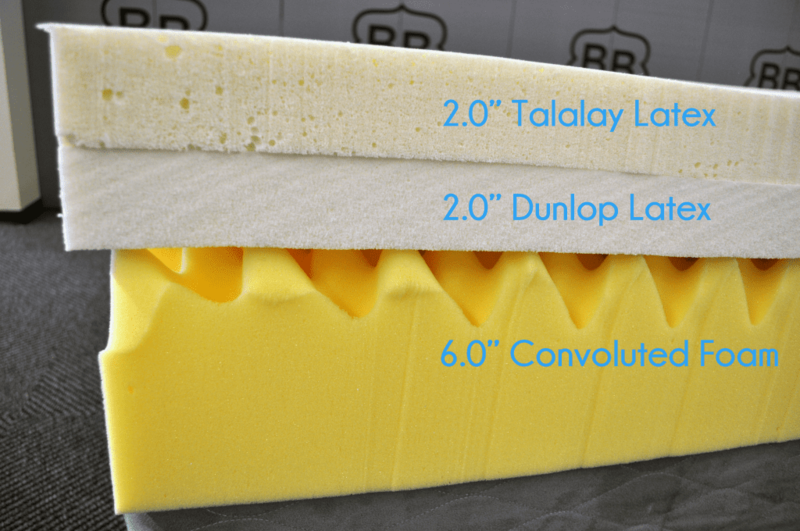 The 2” middle layer is the firmer, denser Dunlop latex. It gives support to the Talalay latex above, and it transitions to the support of the base layer beneath. No pores are shown in illustrations, but airflow is inferred, since it is a factor in the base layer. The 6” base support layer is very firm high-density polyurethane foam. This is the underlying support for the whole mattress. Together with the middle layer, it is to prevent bottoming out. Its top surface is convoluted. Two reasons are stated for this. First, it allows for some conformity at this level. Second, the convolutions let air circulate for cooling and freshness. This presumes that air passes through the Dunlop latex second layer. Brooklyn Bedding says that the #BestMattressEver is designed for three kinds of foundations: box springs, slats, and platform beds. They do sell the Simple Life Tri-Fold Foundation, a fold-out steel framed box with a steel rod (or wire) grid support surface. Let’s compare Brooklyn Bedding’s #BestMattressEver to three mattresses with latex sold by Selectabed. The Taluxe is a multi-layered latex mattress. The Fibro-Pedic and the Soft-Pedic are both hybrids of latex and memory foam. A close equivalent of the #BestMattressEver by Brooklyn Bedding was the Taluxe by Selectabed the mattress subsidiary of Relief-Mart. Like the BB model, this was a 10” mattress with a polyfoam base and 2” latex comfort layers with increasing firmness. It is this graded support which provided the best combination of pressure relief and support in each model. However, there are a few distinctions. Whereas the #BestMattressEver has two latex layers, Taluxe had three. Since each was 2” thick, this left the support base in the Taluxe at 4” while it is 6” in BestMattressEver. BB uses both Talalay and Dunlop latex in the #BestEverMattress. All three latex layers in the Taluxe are Talalay, which is more evenly textured than Dunlop, and it is more breathable. The Taluxe top layer was extra soft, the second layer medium firm, and the third layer very firm. Having three latex layers justified having a softer top with a finely graded transition of support to the extra firm base. In 2018, Selectabed delisted the Taluxe, leaving the Fibro-Pedic and Soft-Pedic as their only latex mattresses. Fibro-Pedic was designed by Dr. Swartzburg for his wife, who has fibromyalgia. This is a modern parallel to the invention of pocket coils by James Marshall for his wife in 1900. Fibro-Pedic is a 9” high mattress with three layers of equal thickness. The 3” top layer is 4-lb. memory foam. This density was chosen for the top to give the sleeper immediate relief, the same reason it is used at the top of the Tri-Pedic mattress. The middle 3” layer is Talalay latex. This is zoned with softer foam at the foot and head and firmer in the center. This gives more support under most of the body’s weight to prevent sagging, since latex is not heat-sensitive like the 5-lb. memory foam in the middle of the Tri-Pedic. Using latex in the middle provides more consistent support which will be adaptive when the sleeper moves, an advantage that latex has over 5-lb. memory foam. The 3” base layer is high-resilience polyurethane form for even underlying support with more shock-absorbing give than a platform bed or the floor. The cover of the Fibro-Pedic is a stretchable cotton terry velour, which is very breathable. Soft-Pedic is, as the name implies, softer than the Fibro-Pedic and the Tri-Pedic. It is 11” high with four layers. The cover is Relief-Mart’s Kool–Flow knit with micro-vents for enhanced breathability. There are two 2” layers of memory foam in the Soft-Pedic, 4-lb. in the top and 5-lb in the second. This has a similar effect to the surface feel of the Tri-Pedic. The third layer is, as the middle layer of the Fibro-Pedic, 3” of zoned Talalay latex. It is a transition layer. Though not as firm as the 4” polyfoam base layer beneath, it does provide support, the firmer center zone holding the heaviest portion of the body. The #BestMattressEver is a latex mattress, not memory foam nor a hybrid. Dr. Rick Swartzburg has already outlined distinctions between the two key materials. Both are conformable, but latex is springy. It continues to push up against the body, which means some pressure on the large joints. Some people like this. On the other hand, memory foam responds to body heat, softening up and shaping itself to the body. This gives more pressure relief as it cradles the sleeper, but it does not change as fast when the sleeper moves. This makes some people feel trapped. Dr. Swartzburg solved this by using a less dense (less heat sensitive) memory foam in the top layer and the dense (more heat sensitive) memory foam in the next.. The greater conformity and pressure relief is why memory foam is at the top of the Fibro-Pedic and Soft-Pedic. Latex (especially Talalay) is cooler than memory foam, another reason some prefer it. This is because the more heat-sensitive memory foam is, the more heat it accumulates. Talalay is usually made with vertical pores, letting air flow through it. When memory foam is ventilated like this, the airflow keeps it cooler. Several manufacturers ventilate memory foam in this manner. This is a key part of the Airflow Transfer System featured in TempFlow mattresses and an option for Tri-Pedic models. The key to really cooling any mattress is venting this air outside the mattress by directing it to a porous border. The use of Talalay as the sole form of latex in the Selectabed mattresses makes them more hypoallergenic. Dunlop latex generally still has some of the proteins from the rubber tree sap. It is the proteins that trigger latex allergies. These are washed away in the rinsing portion of the Talalay process of molding and curing the latex foam. The Brooklyn Bedding boxed bed has good reports from most reviewers for its support and comfort. However, a few have complained about customer support, while many others are satisfied with it. Some of this may come from being a smaller company that now has a national market – in other words, growing pains. Their boxed model is good for a latex bed. The use of Dunlop latex may trigger latex allergies, but this is lessened by placing Talalay at the top, since most of these allergies are through skin contact. Mattresses under the DreamFoam brand will be covered in a separate review. At this time (when updating this review in 2018), the #BestMattressEver is no longer listed on Amazon. Therefore no current Amazon reviews are for this model. However, Brooklyn Bedding considers the Brooklyn Signature a variation of the #BestMattressEver, and continued the reviews on their website. The last 237 reviews on their site (as of 7/26/2018) are for the Signature, so the previous reviews, all from verified customers, are for #BestMattressEver. Amazon still has archived pages for the first version of the Signature, which still had the foam base support layer, but changed content in the comfort layers. This version had a 4.0 average rating with 104 reviews. According to Sleep Like the Dead, Brooklyn Bedding posts unfiltered reviews on their site. 3,095 verified customers reviewed the #BestMattressEver. The average rating was 4.66 out of 5 stars (93.12%). However this includes the early version of Signature, with the 6″ polyurethane foam base and latex-like foam in the comfort layers. Going back further in the reviews, the original #BestMattressEver still has excellent customer response, close to 4.6 (92%). In 2017, Brooklyn Bedding updated the #BestMattressEver, renaming it Brooklyn Signature.